Club Penguin Cheats by Mimo777 Club Penguin Cheats by Mimo777: Club Penguin Game Day Conquer The Island! Here is a cool trailer for the new Club Penguin game for the Wii! It will be called Club Penguin Game Day Conquer The Island. Here are some cool screen shots. Did you notice the yellow team apparel? Hmm, I wonder if we will have yellow items in the upcoming catalog? Click here to see the Club Penguin Game Day Toys! Don't you think they are the same? how do you change the Gender of your player on 'Find Mimo on Camp Pete'? & will you link your website to mine? In the orignal DS game, Elite Penguin Force, you can transfer coins! You just cant transfer items!! lol, yay finally! You posted it! I wana play the dance game and have snowball fights the most. What game is everyone looking forward to the most? Mod me! site!! CPG DA BOMB GUYZ! Well, im glad it's for Wii cause Nintendo games are made more for kids like Club Penguin and Mario and stuff. PS3 games arn't really like that in the way Nintendo games are. I can see what you mean if you don't have a Wii though. Maybe in the future they will make a Club Penguin game for a few different systems. lol, I noticed that only a couple times in the trailer. It still looks pretty good though. I can't wait for it, how about you? AWSOME now we can get yellow team items and green (yellow more rare) plus if clubpenguin is cool enough theyll mak eit free to play can also transfer items! cant wait! Club Penguin Elite Penguin Force Herbert's Revenge can. You gotta play a mission then just download some coins or something. 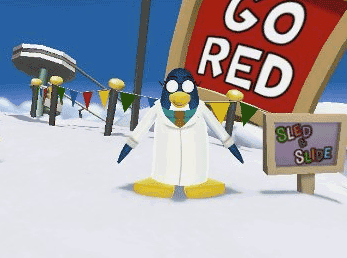 You should automatically have the clothes from the game on your penguin account. Try it. Same here. Im counting down the days till it releases. Cool. Happy (late) Birthday to you! Your present is your Wii! Have fun with it! 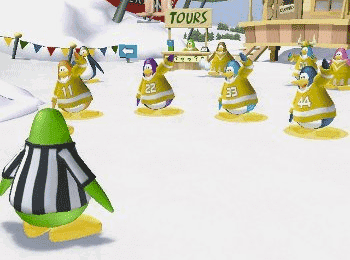 I'm guessing next there will be a yellow team on club penguin... according to the game. I want that sooo bad! I will probably get it for Christmas or my birthday. My birthday is also December... just like christmas... I'M TOO SELFISH TO WAIT THAT LONG! (sorry for caps) XD jk, I cant wait... or can I? They look pretty cool. I like how they are a little on the fat side hehe! Nice! I love the wii! You should get Wii fit. But to the subject, this game looks really fun! Happy early birthday! My birthday is in september also!Yay september birthdays! Yesh, yesh they do. Most dresses on club penguin make you look fat and i always forget to buy the ones that dont make u look fat. They need a penguin gym. penguins always seem to look fat. Oooh! That would be cool! ps3 is easier to control than the wii. and 3-D rocks! Holy cheesepuffs, yellow jersey and free items! did i just see a green football team with pink bunny slippers and fairy wings? wow you know i have the first club penguin game (club penguin elite penguin force) and they dont let me transfer my items just coins!!! and i dont have a wii. -.-"
i think ill change my name to colossus excuse me the colossus!! aha!!!! finally i remembered my account!!!! WOOT!!!! lol holy cheese puffs anybody notice the red spikester? or the yellow jersey? I thought there was a black puffle you get? I'm not sure, most people that got the game got the puffle too. Hey mimo. i noticed a yellow team. that is something that they should add to the game online. im looking for it in the future. this is so cool i had no idea they were making this so now I'm really excited!P.S. im birthday is in 3 days! I'm getting it! I have the Wii, and I hope to get it for my birthday, the 28th of September! Me too. I have a psp. Hey Mimo!! Its me Private1998! just wanted to say i cant wait for this game to come out! It looks soo cool!! P.S I want to be a CPG MOD!! my penguin name is yelowin, so im looking forward to the yellow jersey ;)also i noticed that in the second and third pictures there is a penguin named bob.... could this be billy bob?? probably is... anyways the game looks cool! i want to get it! im am exited thaat it is on wii because i dont have ds lite or dsi! YAY! (lol sorry for caps) my birthday is in december too!in fact, its december 13 (nooo not 13! )its exactly 12 days from christmas!lol! *on the first day of christmas my family gave to me... presents for my bir-ir-irth-day.! 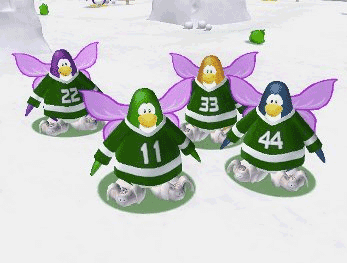 green is already out in club penguin internet game(its hidden in the snow and sports catolog i think)but yellow would be COOL! lol... WHERE IS THE RED SPIKESTER! That is pretty unfair, but its not completely impossible to get ya know? yah its really weird isnt it? idk if its a glitch, or something they did on purpose. maybe since if you complete all the stamps on other games they double the points for you, they thought we should be rewarded even more for playing games without stamps... but i really have no idea. in all of the shots!! :0 I may get the game for Christmas!!! :) Also if we have a hard time choosing teams, it's yellow even though im a blue fan at heart!!!!! On EPF you can't but in EPF Herbert's Revenge you actually can. its official! 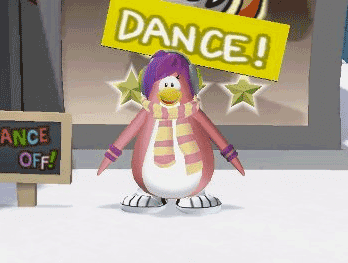 i am a famous penguin! billybob said i was famous and rare! i met him he realy said tht! my penguin name is cnbcnb10! 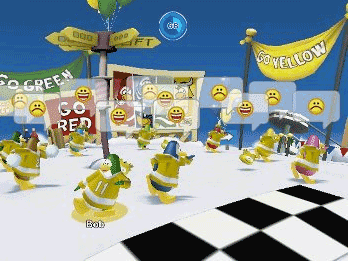 Club Penguin Game Day looks great. It looks so much fun aswell. 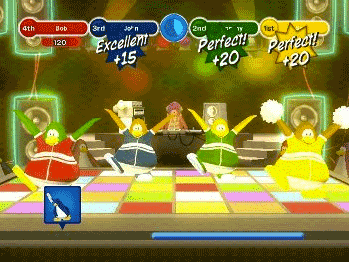 The Dancing game looks really cool! PS Will you get it the first day it comes out? PPS Do you know the exact date it will come out? Awesome!! I am SO getting that!! Back from my holidays, and back to modding!! Cool lol like the way u can upload items!! I just cant wait for the Club Penguin : Game Day. I will be the first who buys it! I was just asking myself, don't you think its time for a little Party! or maybe a contest! Or a membership Giweavay?? im getting this rocking game! ~~~~~~~~~~~~~~~~~~~~~~~~~~~~~~~~~~~well the sled game looks cool and the snowball noe and all of them! im 12 my dad thinks im a bit old for cp what should i say to convince him to let me buy the game? it looks sooooooo awesome although is it just ne or are the missions not working!?!?! It looks like it does the same things as My Sims party and Mario Party. Basically you just play games until you feel sick of the game. ya i think all of those things too! i think its time for a mimo party on club penguin or a contest or a membership giveaway! great minds think alike!! well say to him that there are some teenagers/ old teenagers that still play club penguin. even tho 8 year olds play it too, its still fun. i hope it comes out soon so i can get it. the game looks really fun! I agree with you there!! But Club Penguin probably hadn't thought of it back then when the 1st game came out. I also have only the first game, but hey!! They will bring the new items out on CP for sure!! So don't be so moody and think how many coins you can get from the first game and transfer them onto your online account!! This comment is NOT about this topic but, why isn't Sensei on the Stamp Book? Well Billybob probably helps designing the games and testing them out. What a cool job huh? i saw in youtube and it says it comes out in 7, September! Mimo! Clubpenguin hasn't got the agent card anymore! It's just the tour guide letter! I think the Game is called Club Penguin Game Day. The Conquer the island part is the slogan, I think. "WOW I CANT WAIT! Is that the tallest mountion in cp? Thats so sweet! It's not Tallest Mountain - this one's a NEW challenge!" I decided I'm not going to give up so I'm going to attempt being a mod again. I'm guessing that they didn't put him on there because he doesn't visit CP much. MIMO U CAN UPLOAD ITEMS! the non members will love it! they are balancing the advantage of stuff more now by this! p.s. sorry for such a long comment im just HYPER im so Hyper that this is what i spelled that word first HIPER SORRY FOR COMMENT LONG! i dont get some people because they are saying non members can get items without paying.well if non members had money to buy the game why dont they buy membership? but its going to be good.